At Kettle, they are passionate about creating great chips. They use only the best Australian grown potatoes slow cooked in sunflower oil & seasoned with the finest all natural ingredients. The end result are naturally delicious potato chips every time. 100% natural. 100% delicious. Contact us for availability. 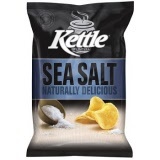 Prepare to set sail with Kettle Natural Sea Salt Chips. With an opening tug, you'll immediately be drawn down into the deep pack, engulfed by the heady scent of natural salt. 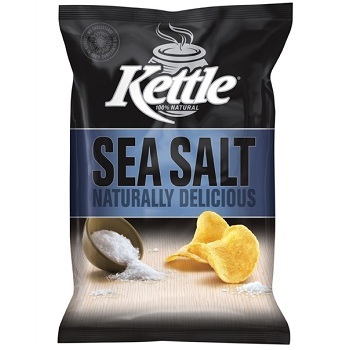 Natural Sea Salt flavour Potato Chips in 185g bag. Price each - Order 12 packs to receive one carton. 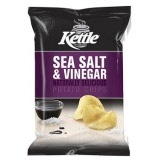 With Kettles Sea Salt & Vinegar, you must overcome the reeling hit of vinegar as you crack open the bag. Then, prepare yourself for the first taste of that bold, tangy vinegar and natural sea salt. Natural Sea Salt & Vinegar flavour Potato Chips in 185g bag. 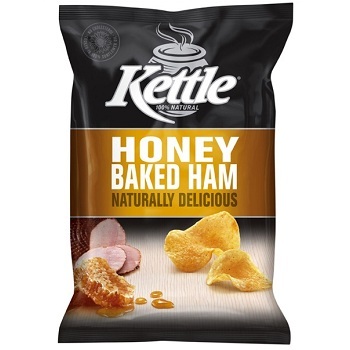 Once you tear open that Kettles Honey Baked Ham bag, it'll hit you. waves of delicious ham scent. Strong enough to whet your appetite, yet mild enough to enjoy chip after chip. Natural Honey Baked Ham flavour Potato Chips in 185g bag. These products can ONLY be ordered by our existing Account customers - Please contact us for current availability. Orders received for Non-Account customers and/or for overseas destinations will NOT be processed.